Posted 22 April 2014 & filed under 2000 -, Churches, Life and leisure, Oral history, Places and spaces, Schools, Shops, Streets, Tony Picciuto. 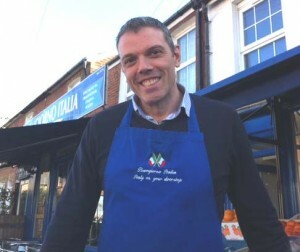 Many people will recognise Tony Picciuto who owns the award winning Buongiorno Italia shop in Lattimore Road. Tony’s parents were born in Italy and came to St Albans in 1966. The family moved about a lot in the city. At one time they lived in Cornwall Road. Tony has lived in Tavistock Avenue for over 20 years and describes the advantages of living near the Vesta Avenue shops, the Catholic church, the local primary schools and of course the community and social activities.